High Commercial College, Tokyo, Japan. The secret of success is an open secret. Everybody has got something to say on the subject, and perhaps you often heard its general principles enunciated, but the vital importance of the subject justifies any amount of emphasis driving it home into the minds of the people. At the outset let us put this question to Nature around us. All the "books in running brooks and sermons in stones" preach with unmistakable accent the gospel of continuous, incessant work. Light bestows upon us the power of sight. Light gives a mainspring to all beings. Let us see what light is thrown on the question by light itself. Rama will take for illustration the ordinary light—the lamp. The underlying secret of a lamp’s lustre and splendour is that it spares not its wick and oil. The wick and oil or the little self is being constantly consumed and glory is the natural consequence. There it is, the lamp says, spare yourself and you will be immediately extinguished. If you seek ease and comfort for your bodies and waste your time in sensual pleasures and luxury, there is no hope for you. Inactivity, in other words, would bring death to you, and activity and activity alone is life. Look at the stagnant pond and the running stream. The crystal water of the rustling river is ever fresh, clear, drinkable and attractive. But on the other hand see how disgusting, odorous, filthy, dirty, stinking and stenching is the water of the stagnant pond. If you wish to succeed, follow the line of action, the constant motion of a river. There is no hope for a man who would waste his wick and oil by preserving it from consumption. Follow the policy of a river, ever progressing, ever assimilating, ever adapting itself to the environments and ever performing work, ever performing work is the first principle of success. From good to better daily, self surpassed. If you work on this principle, you will see that "It is as easy to be great as to be small." Everybody loves white objects. Let us examine the cause of their being the objects of universal love. Let us account for the success of the white. The black objects are everywhere hated, discarded and rejected, and let us take this fact as it is and account for it. Physics tells us the reality of the phenomenon of colour. Red is not red, green is not green; black is not black, and all is not what is seems. The red rose gets its lovely colour by reflecting or throwing back that colour. The other colours in the Sun’s rays are entirely absorbed by the rose and nobody attributes those colours to the rose. The green leaf absorbs all other colours in light and appears fresh and green by the very colour which it denies to itself and throws back. Black objects have the property of absorbing all colours and reflecting no light. They have no spirit of sacrifice in them and no charity. They do not renounce even a single ray. They do not throw back even an iota of what they receive. Nature tells you that black, black like coal, shall he appear who refuses to give unto his neighbours what he receives. The way to receive it to give. The secret of appearing white is the total renunciation—to throw back instantaneously on your neighbours all that you receive. Acquire this virtue of white objects and you must be successful. What does Rama mean by white? Europeans? Not Europeans alone, the white mirror, the white pearl, the white dove, the white snow, all the emblems of purity and righteousness stand as your great teachers. Imbibe, therefore, the spirit of sacrifice and reflect unto others all that you receive. Have no recourse to selfish absorption and you must be white. A seed in order that it may bud forth into a tree must perish itself. Fruition is thus the final result of complete self-sacrifice. 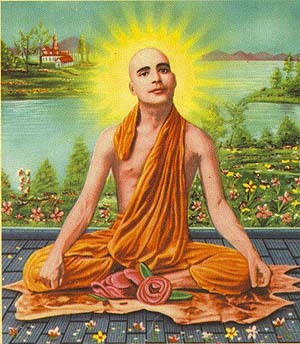 All teachers will bear Rama out in the statement that the more we impart the light of knowledge, the more we receive. Students know that when they are speaking in their literary societies, the moment the idea "I lecture" comes into prominence within their mind, the speech in marred. Forget your little self in work and entirely throw yourself into it, you will succeed. If you are thinking, become thought itself, you shall succeed. If you are working, become work itself, and thus alone you shall succeed. When ‘I’ shall cease to be. Here is a story of two Indian Rajputs who went to Akbar, the great Moghal emperor of India and sought employment. Akbar inquired about their qualifications. They said they were heroes. Akbar asked them to prove their statement. Both drew out their daggers from the scabbards. There the two lighting flashes shone in Akbar’s court. The flash of the dagger was symbolic of their inner heroism. Immediately the two lightning flashes joined the two bodies. Each kept the point of his dagger on the other’s breast, and both gave proofs of their heroism by running through the breast their daggers with stoic calmness. The bodies fell, spirits met and they were proved heroes. Rama points not to the story which is shocking in this advanced age, but to the moral it teaches. The moral is, sacrifice your little self, forget it in the performance of your work, and success must be yours. It cannot be otherwise. "Cannot" Rama says; the desire for success must die in your work before achieving success. Love is another principle of success. Love and be loved, that is the goal. The hand in order to live must love all the members of the body. If it isolates itself and thinks ‘why should the whole body profit by my earnings’, there is no help for the hand, it must die. For in order to be consistent in its selfishness, the hand should not put into the mouth the meat and drink that were secured by dint of the hand’s labour alone whether at the pen or at the sword, etc., and should rather inject into its own skin all sorts of nourishing food, thus excluding the other organs from sharing the fruits of its labour. True, this injection or sting of a wasp or bee may make the hand fat, but all that fatness does more harm than good. Swelling is not improving and the sore hand is sure to die by its selfishness. The hand can flourish only when it realizes in practice the identity of its self with the self of all other organs of the body and does not alienate its own good from the good of the whole body. Cooperation is nothing but superficial manifestation of love. You hear so much about the utility of cooperation, and Rama needs hardly enlarge upon it. Let that proceed from your innate love. Be love and you are successful. A merchant who does not look upon his customers’ interests as his own, cannot succeed. In order to prosper he must love his customers. He is to observe them with his whole heart. Another factor that plays a very important part is Cheerfulness. You, dear brothers, are cheerful by nature. Rama rejoices to see the smiles on your blooming faces. You are the smiling flowers. You are the laughing buds of humanity. You are the personification of cheerfulness. So what Rama wishes to point to you is to keep up this feature of your life till the end of time. Now let us see how it can be preserved. Be not anxious as to the reward of your labours, mind not the future, have no scruples, think not of success and failure. Work for work’s sake. Work is its own reward. Without dejection at the past and without anxiety as to the future—work, work, work in the living present. This spirit will keep you cheerful under all circumstances. To a living seed must be attracted by an inviolable law of affinity all that it requires of air, water, earth, etc., to fructify. So does Nature promise every kind of help to a cheerful active worker. "The way to more light is the faithful use of what we have." If in a dark night you are to travel a distance of twenty miles and the light in your hand shows only up to ten feet, think not of the whole way being unilluminated, but walk up the distance that is already lighted; and ten more feet will of themselves be illuminated. You will not find a spot in the dark. So a real earnest worker by a necessary law encounters no obscure ground in his course. Why then damp our cheerful spirits by uneasiness about the future? Falling suddenly into a lake persons who do not know how to swim, can save themselves by simply preserving their equanimity. The specific gravity of man being less than that of water, he will keep floating on the surface. But ordinary human beings lose their balance of mind and by their very struggle to float get drowned. So oftentimes the very unrest for the future causes failure. Let us see the nature of thought which clings to the future and runs after success. It is like this. A man goes to catch his own shadow. Let him run till the end of time, never, never will he be able to catch it. But let him turn his back upon the shadow and face the Sun, then lo! the same shadow begins to run after him. The moment you turn your back upon success, the moment you cease to think of the consequences, the moment you concentrate your energy in your present duty, the same instant success is with you, nay, dogging you. Hence follow not success, make not success your goal, then and then only success will seek you. In a court of justice the magistrate needs not invite the parties, the lawyers and the orderlies, etc., to make his court, but let the magistrate sit on the throne of justice by himself and the whole panorama opens of itself before him. So it is, dear friends, be at your own place in profound cheerfulness and all that you require for success will lay itself at your feet. The next point that Rama will urge upon your attention and will exhort you to verify by your own experience is fearlessness. Lions may be tamed by a single glance, enemies may be pacified by a single look, victory may be won by a single dash of fearlessness. Rama has roamed in dense valleys of the Himalayas. Rama has met tigers, bears, wolves and venomous animals. No harm was done to Rama. The wild beasts were looked straight in the face, glances met, the fierce animals were outscared and the so-called terrible creatures sulked away. Thus it is, be fearless and none can harm you. Perhaps you have seen how a pigeon in the sight of a cat shuts his eyes, perhaps thinking that the cat does not see him because he does not see the cat. What happens? The cat pounces upon the pigeon and the pigeon is devoured up. Even a tiger is tamed by fearlessness and even a cat eats him up who fears. You might have seen how a trembling hand can never successfully pour a liquid from one vessel into another. It is sure to be spilt. But how easily the steady, fearless hand can handle the dear liquid without spilling a drop. There is Nature once again teaching you in unsurpassed eloquence. Once a Punjabee sepoy was down with some fell disease on board of a ship, and the doctor passed the capital sentence of throwing him over board. Doctors! these doctors sometimes pass capital sentences. The sepoy came to know of it. There are flashes of fearlessness even in ordinary beings when brought to bay. He sprang up with unbounded energy and became fearless. He went straight to the doctor and pointing his pistol towards him said, "Am I ill? Do you say so? I will shoot you." The doctor immediately gave him a certificate of health. Despair is weakness, avoid it. The whole strength comes from fearlessness. Mark the word fearlessness, be fearless. Last but not the least, nay, the vital principle or the very keynote of success is self-reliance, self-dependence. If anybody ask Rama to give his philosophy in one word, he would say "self-reliance," the knowledge of Self. Hear, O man! Know thyself. True, literally true it is, when you help yourself, God must help you. Heaven is bound to help you. It can be proved, it can be realized that your very Self is God—the Infinite, the Omnipotent. Here is a reality, a truth waiting to be verified by experiment. Verily, verily depend upon yourself and you can achieve anything. Nothing is impossible for you. The lion is the king of the forest. He depends upon his own self. He is bold, strong and the conqueror of all difficulties, because he is in himself. Elephants when first seen in India were aptly called by the Greeks "moving mountains," are always afraid of their enemies. They always live in groups and employ sentinels to keep watch over them when they sleep and none of them relies on himself or his own capabilities. They regard themselves to be weak and the law is that they must be weak. The one daring dash of the lion intimidates them and the whole group of elephants is bewildered—whereas a single elephant, the moving mountain may trample scores of lions to death under his feet. A highly instructive story is told of two brothers who equally shared their inherited property but after some years one was reduced to indigence and the other multiplied his fortune by tens. The answer to the question "why and how" put to the one who became a millionaire was that his brother always said, "Go, Go," while he himself always said, "Come, Come". The meaning is that one used to order his servants, "Go, go, and do this" while he himself was always lying on his feather-stuffed cushions; and the other was always up on his feet and at his work, and called his servants for help, "Come, Come, and do this." One depended upon his own power and riches multiplied; the other ordered his servants, "Go, go." They went away, but fortune also obeyed his command, "Go, go," and thus he was left alone. Rama says, "Come, brothers, come, and share Rama’s success and happiness." So it is, brothers, friends and countrymen! Man is the master of his own destiny. If the people of Japan give Rama more opportunities to convey his thoughts to them, it can be shown that there is no rational ground whatsoever for putting faith in myths and fables and placing our centre outside ourselves. Even a slave is a slave because he is free. Out of freedom we are prosperous, out of our own freedom we are suffering, out of our own freedom we are enslaved. Then why should we grumble and croak, and why not make use of our real freedom to free ourselves physically and socially? Before Me was no world, ‘tis My creation. ‘T was I who raised the Sun from out the sea. The Moon began her changeful course with Me. Realize that once and you are free this moment. Realize that once, and you are ever successful. Realize that once, and the very dingy dungeons are converted on the spot into blessed Elysium.